Information correct at time of printing. Sentosa reserves the right to make changes without further notice herein. 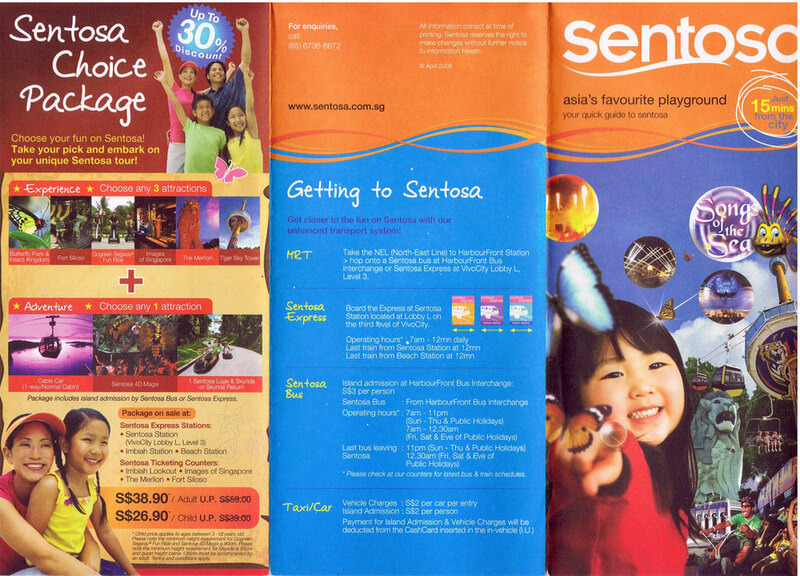 Get closer to the fun on Sentosa with our enhanced transport system! > hop onto a Sentosa bus at HarbourFront Bus Interchange or Sentosa Express at VivoCity Lobby L, Level 3. Board the Express at Sentosa Station located at Lobby L the third IveI of VivoCity. * Please check at our counters for latest bus & train schedules. 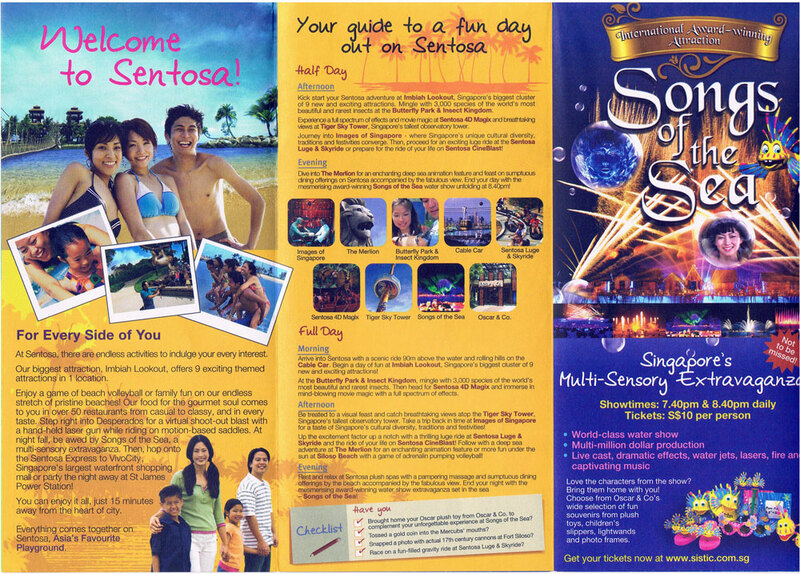 Choose your fun on Sentosa! Take your pick and embark on your unique Sentosa tour! Package includes Island admission by Sentosa Bus or Sentosa Express. *Child price applies to ages between 3 - 12 years old. Please note the minimum height requirement for Gogreen Segway Fun Ride and Sentosa 4D Magix is 90cm. Please not the minimum height requirement for Skyride is 85cm and guest height below 135cm must be accompanied by an adult. Terms and conditions apply. At Sentosa, there are endless activities to indulge your every interest.Our biggest attraction, Imbiah Lookout, offers 9 exciting themed attractions in 1 location. Enjoy a game of beach volleyball or family tun on our endless stretch of pristine beaches! Our food for the gourmet soul comes to you in over 50 restaurants from casual to classy, and in every taste. Step right into Desperados tor a virtual shoot-out blast with a hand-held laser gun while riding on motion-based saddles. At night fall, be awed by Songs of the Sea, a multi-sensory extravaganza. Then, hop onto the Sentosa Express to VivoCity, Singapore‘s largest waterfront shopping mall or party the night away at St James Power Station! You can enjoy it all, just 15 minutes away from the heart of city. Everything comes together on Sentosa, Asia‘s FavouritePlayground. 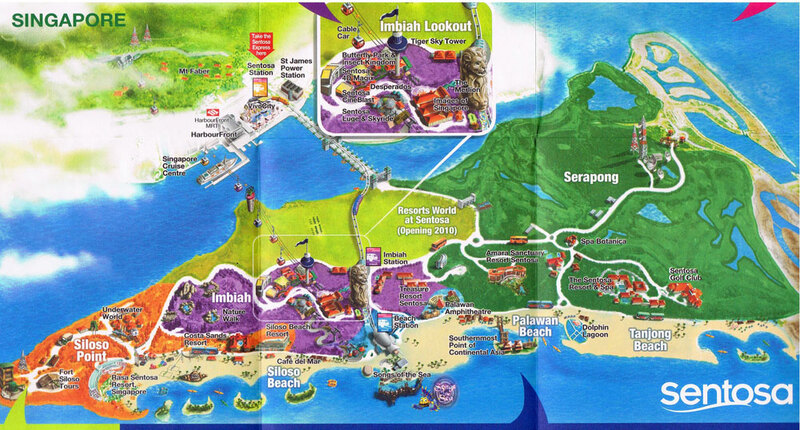 Kick start your Sentosa adventure at Imbiah Lookout, Singapores biggest cluster of 9 new and exciting attractions. Mingle with 3,000 species 0f the world‘s most beautitul and rarest insects at the Butterfly Park & Insect Kingdom. Experience a full spectrum uf effects and movie magic at Sentosa 4D Magix and breathtaking views at Tiger Sky Tower, Singapore‘s tallest observatory lower. Journey into Images 0f Singapore - where Singapore‘s unique cultural diversity, traditions and festivities converge. Then, proceed for an exciting luge ride at the Sentosa Luge & Skyride or prepare for the ride of your life on Sentosa CineBlast! Dive into The Merlion for an enchanting deep sea animation feature and feast an sumptuous dining offerings an Sentosa accompaniod by the fabulaus view. End your day with the mesmerising award-winning Songs of the Sea water show unfolding at 8.4Opm. mind-blowing movie magic with a full spectrum of effects. Be treated to a visual feast and catch breathtaking views atop the Tiger Sky Tower, Singapore‘s tallest observatory tower. Take a trip back intime at Images 0f Singapore for a taste ot Singapore‘s cultural diversity, traditians and festivities! Up the excitement factor up a notch with a thrilling luge ride at Sentosa Luge & Skyride and the ride of your life on Sentosa CineBlast! Follow with a deep sea adventure at The Merlion tor an enchanting animation feature or more fun under the sun at Siloso Beach with a game of adrenalin pumping volleyball! Rest and relax at Sentosa plush spas with a pampering massage and sumptuous dining offerings by the beach accompanied by the fabulous view. End your night with the mesmerising award-winning water show extravaganza set in the sea — Songs of the Sea! Brought home your Oscar plush toy from Oscar & Co. to complement your untforgettable experience at Songs of the Sea? Tossed a gold coln into the MercubS‘ mouths? Snapped a photo with actual l7th century cannons at Fort Siloso? Race on a fun-filled gravitiy ride at Sentosa Luge & Skyride? Love the characters from the show? Bring them home with you! Choose from Oscar & Co‘s wide selection of fun souvenirs from plush toys, children‘s slippers, lightwands and photo frames. Stroll through the lush surrounds of the Butterfly Park & lnsect Kingdom and marvel at live butterflies fluttering around you at this cool outdoor conservatory. Feel on top of the world as you ride some 90m above the sea and enjoy magnificent views of Sentosa island, Singapore‘s City skyscrapers, one of the world‘s busiest harbours and The Southern Islands. Pricing excludes Sentosa Island Admission. Step right in at this 20-seater cinema for a virtual shoot out blast! Ride on motion-based saddles and gallop through this animated movie while shooting bandits using your hand-held laser gun. Experience Singapore‘s colourful history, rich cultural traditions, festivities and celebrations at the award-winning Images of Singapore. Feel every spine-tingling moment to the fullest with the special “live“ environmental effects such as water spray, surround sound and individually controlled motion seats! 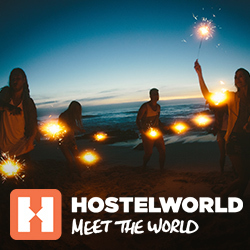 parallel worlds of fun and mind-blowing experiences! Hop onboard the luge cart and race off for adrenaline ride along a 650m track and take the Skyride through a scenic 320m long tree-top ride back to the starting polnt to do it all over again. Take in fabulous 360° views of the surrounding Singapore skyline and neighbouring islands from its vantage point atop Singapore‘s tallest public viewing tower standing at 131 m above sea level! Venture into Singapore‘s tallest icon at 37m high and enjoy panoramic views of Sentosa with its surrounding islands, and discover the legend of the Lion City in an animated film. Fill your tummies — and treat your tastebuds to a spread of local cuisine from Nyonya Laksa to Hainanese chicken rice at Tastes of Singapore @ Imbiah! Remember to bring home a bottle 0f Chng Kee's damed premium and premixed sauces for an authentic taste 0f Asia at Chng Kee's Spice of Life (Images of Singepore). 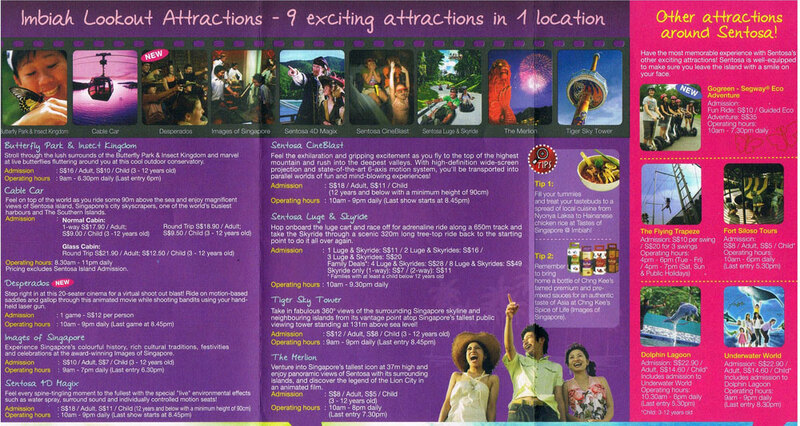 Have the most memorable experience with Sentosa‘s other exciting attractions! Sentosa is well-equipped to make sure you leave the island with a smile on your face. Rejuvenate and relax in a haven of serenity on Sentosa. school of Turkish spa fish swim up and gently nibble on your feet at Fish Reflexology, Underwater World. Immerse in a new fitness and spa experience at the Health Club & Spa or award-winning Spa Botanica — Singapore‘s first tropical garden spa. Home to Singapores vibrant beach volleyball culture, Siloso Beach brims with energy with an array of activities such as kayaking, rollerblading and more! Singapores hippest beach also boasts an array of dining and shopping options from beach bars such as Caf del Mar which oozes ambient music and tantalizing food, Amis - Dine, Chill, By the Sea for some yummy finger food, a spread of local delights at Tastes of Singapore @ Siloso and the Island Life Shop which stocks island resort style apparel. Kids and adults alike will love Palawan Beach - Singapores happiest family beach! Engage in wholesome family fun by crossing the suspension bridge to get to the Southernmost Point of Continent Asia or Asias dosest point to the Equator. Check out the activites happening right here! lapping waves and jazz music at Sentosa's premier beach bar. Bring your family to watch the delightful Animal & Bird Encounters daily show at Palawan Amphitheatre where adorable animal friends tickle and tease with their antics! Indulge in some quallty time with your loved ones at Tanjong Beach to the romantic sights of the twinkling ships and lights. your seafood grilled to perfection while looking on the fabulous view of the South China Sea at The Cliff @ The Sentosa or have a relaxing cuppa at The Sentosa Resort & Spa. Adore the pink dolphins? Bring home a piece of the frienly mammals with a wide variety of exclusive pink dolphin souvenirs like key rings, plush toys and even chocolate! the beautiful crowd at Caf del Mar.